Toronto, Canada’s largest city, is vibrant, sophisticated and fun. But where do you start? If you’re planning a trip to Ontario, here’s how to spend one day in Toronto. If you plan to spend one day in Toronto, you’ve made a wise choice! Since no fewer than 25% of Hollywood movies are filmed in this city, clearly there are plenty of things to see. 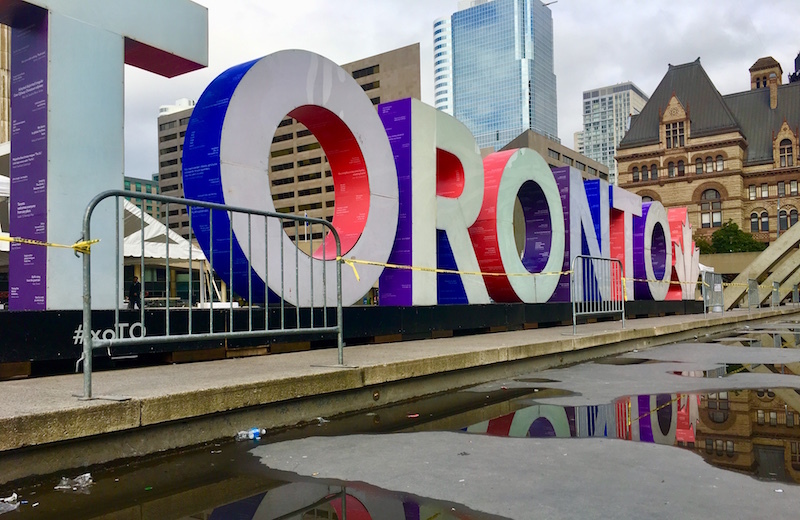 Top Toronto attractions include the Rogers Centre, one of the world’s first stadium featuring a completely retractable roof, and Centre Island, easily reachable via a ferry or water taxi from Toronto Harbour. If the weather is unforgiving (hey, it’s Canada), you can still visit Harbourfront to take a look at the Tall Ship Kajama, a three-mast cargo schooner; stroll down to the Music Garden or visit the PowerPlant, the city’s leading contemporary gallery. Bonus: Entrance is free. The lofty CN Tower is Toronto’s top tourist sight, at least the 1.5 million people a year seem to think it’s worth a visit. Famous for being the tallest freestanding manmade structure in the world – until the even higher Burj Khalifa in Dubai knocked it off its pedestal in 2008 – Toronto’s CN Tower can withstand winds of over 400km/h and an earthquake of 8.5 on the Richter scale. That’s safer than the White House. After you soar up the glass-fronted elevator, you can check out the views, stand on the glass floor or splurge on a meal at the 360 Restaurant – I still think longingly of the tenderloin I had there years ago. You can easily guess why the restaurant is called 360 – it makes a complete panoramic rotation every 72 minutes letting you admire the city 300m below. 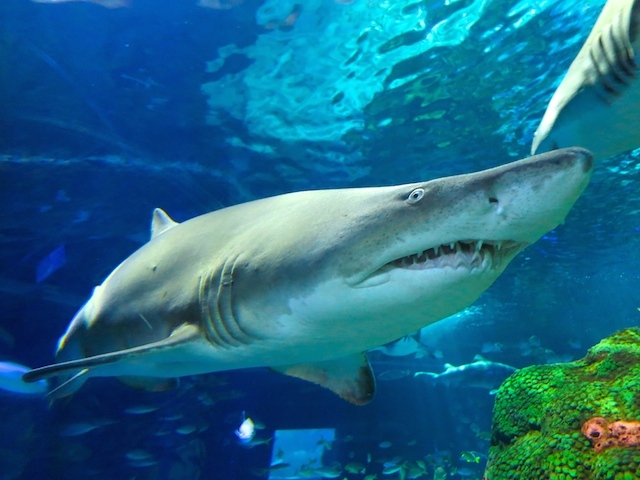 Another attraction in the area is Ripley’s Aquarium of Canada, which is right at the base of the CN Tower. From here you can walk to the Hockey Hall of Fame, a museum devoted to all things ice hockey. Located near Union Station, the Hockey Hall of Fame is where the Stanley Cup lives when it’s not jet-setting around the world. Even if you’re only spending one day in Toronto, it’s hard to resist a wee bit of shopping. The most popular shopping destination is probably the Eaton Centre, a glass-covered mall housing a huge array of shops. While it used to be a bit tired, it’s undergone a total revitalization with the addition of high-end department stores Nordstrom and Saks Fifth Avenue. If you want to grab a bite while you’re there, check out trendy Leña Restaurante at the corner of Richmond and Yonge at Saks. This South American all-day restaurant is getting rave reviews. By the way, I’m told that the Eaton Centre attracts more visitors than Disneyland. (I’m having trouble believing that but there’s no arguing with rumour.) Moreover, the Eaton Centre is on Yonge Street. At 1,896 km in length, it’s world’s longest street according to the Guinness Book of World Records. It’s not the most elegant shopping destination in the world, but it’s always lively and it’s definitely long. Toronto is a city rich in culture and one of the top things to do here is get your fill of art. The Art Gallery of Ontario, (AGO) found right next to Grange Park, holds 80,000 artefacts going back to the first century AD and includes famous artists like Cézanne, Goya, and Matisse. 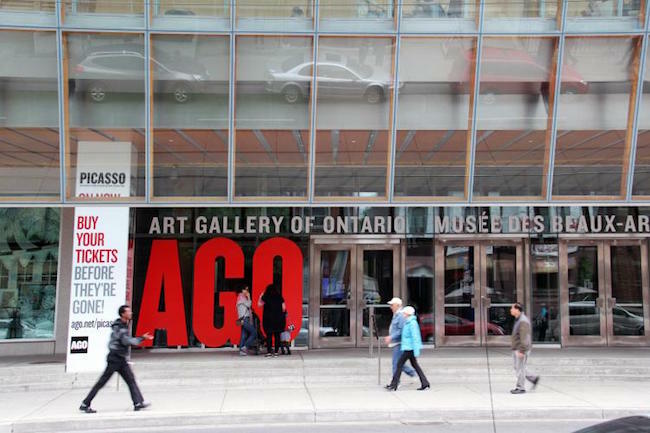 Hosting both permanent and traveling exhibitions and galleries, the AGO is located at 317 Dundas Street West, about a 10-minute walk west from the Eaton Centre. Keep heading north. If you’re fascinated by science, history and nature, stop in at the Royal Ontario Museum (the ROM). Children love the dinosaurs in the Libeskind crystal wing. Who doesn’t? Located at the corner of Bloor and University Avenue, the ROM fits right into a visit to the luxury ‘hood of Yorkville. 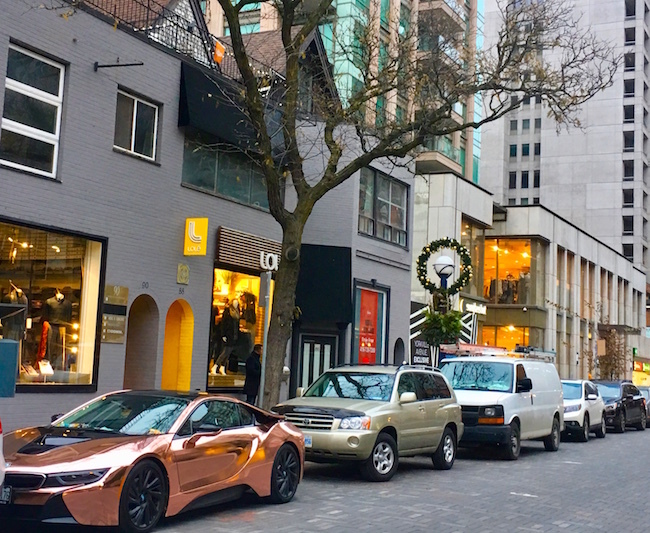 Another shopping destination of note if you’re visiting Toronto is Yorkville, the swanky neighbourhood bordered by Bloor Street, Avenue Road and Bay Street. Here you’ll find high-end designers, especially on Bloor Street, which is referred to as the Mink Mile (by whom, I don’t know). Yorkville and Cumberland Avenues are a delight to walk around with their blue chip galleries, boutiques, 5-star hotels, restaurants and bars. You can also access the upscale Yorkville Village mall from Hazelton Avenue. Hungry? One new addition in Yorkville is Planta, an upscale ‘plant-based’ restaurant, which, I assume, means ‘vegan only more expensive’. Correct me if I’m wrong. And if my husband wants to know where he should take me on date night, Planta will do nicely. Not quite as central, but certainly eye-catching is Casa Loma. This Toronto landmark, at One Austin Terrace near Davenport Road and Spadina Road, was built in 1911 by the fabulously wealthy Sir Henry Pellatt, a businessman who had always dreamed of living in a massive Edwardian castle. He commissioned the famous architect E.J. Lennox to design the most palatial residence that North America had ever seen. At the time, it took 300 people, 3 years, and $3.5 million to mount the majestic assortment of 30 restrooms, 98 rooms, and 25 fireplaces atop of the hill overlooking the city. For Sir Henry Pellatt and wife, Lady Mary, the effort wasn’t too great as he controlled a quarter of the economy of Canada. Yet only 10 years later, the couple’s fortune was ruined by the loss of the electricity monopoly in favour of the government. Yikes. The takeaway here is that you might be better visiting a castle than actually buying one, as you never know where the future will lead. Then again, with real estate prices ballooning in this city, it could be an excellent investment. And speaking of investing, I hope you invest some enjoyable time exploring Toronto, at least for a day. For more information on visiting Toronto, Toronto Tourism’s SeeTorontoNow website is a wealth of tips and advice. If you plan on seeing a number of attractions, an option that allows you to save 36% is CityPASS. 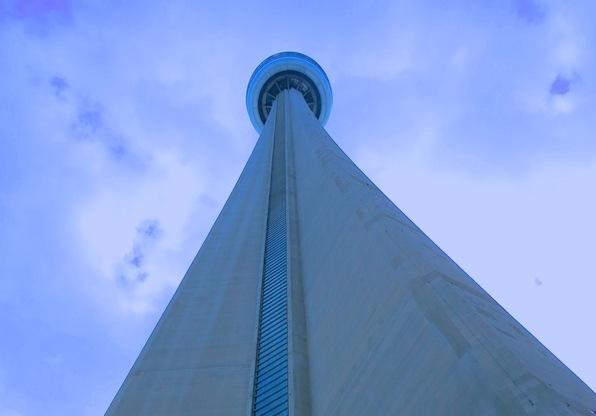 CityPASS admission saves you money if you plan to visit the CN Tower, Casa Loma, the Royal Ontario Museum, Ripley’s Aquarium of Canada and the Toronto Zoo OR the Ontario Science Centre. Getting around: The Toronto Transit Commission, known as the TTC, is a quick and easy way of travelling around downtown. If you’re sightseeing for just one day in Toronto, you can buy a TTC Day Pass for $12.50. You can pick it up at any subway station. Other options for getting around are taxis, Uber, Bike Share Toronto or on foot. 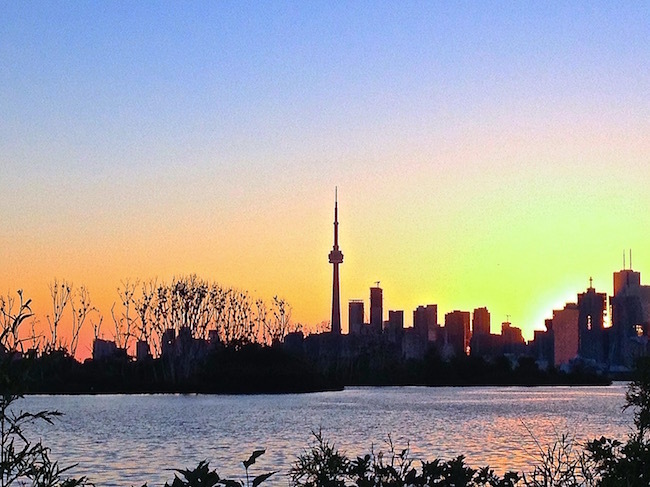 Read more about the top places to hang out in Toronto. Looking to relax? Try this Toronto Spa Reviews article. I was at that TBEX, too, Debra! Ha. It’s a melting puddle in the foreground of the picture, Kirstie. I wish I could have been at City Hall on a nicer day, but I was hoping to capture the reflections. Guess I failed. We can do the EdgeWalk together, Eloise! It’s on my bucket list. It sounds like you visited a lot of Toronto’s top attractions, Jenna. The museums and art galleries are worth it (especially in freezing winter). Toronto is such a great city! We only had one day to explore there as well, but we are hoping to get back again to see more soon! We visited a few of the spots you mentioned like the CN Tower, Chinatown, Kensington Market, but I’d love to see the Art Gallery of Ontario next time. Casa Loma sounds like a really neat spot to visit, as well! I love Toronto but have yet to see most of it. During the TBEX a couple of years ago I stayed in a downtown hostel and walked the city every chance I could. No Edge for me, the architecture of the city was my delight. I’ve heard so many amazing things about Toronto, but never had the chance to visit myself. I’ve read that the food scene is especially great, and there are always new, fun spots opening all the time. In addition to all of the attractions, there is a thriving sports scene too, with MLS, MLB, NHL, and NBA all with huge fan bases. I’m definitely going to have to make it up there at some point! That’s a full day!! I’d love to visit the iconic tower and try the EdgeWalk to defy my fear of heights. That’s what comes in my mind first when I think of Toronto. Thanks for sharing ideas of other things to do! There are direct flights from Brisbane to Vancouver so maybe I’ll visit Canada sooner than I expect! I went to Toronto when I was 11, but I’m dying to get back there again. It seems like a really popular post amongst travel bloggers. I would love to do the Skywalk at the CN Tower. It would be super exhilarating and fun! I love Toronto, was there for TBEX many years ago. Thanks for a fun reminder of how neat the city is and that I’m due for a return. Adding Urban Herbivore to my list to check out the next time I’m in Toronto. That is a lot to try and fit in one day! I had no idea it was such a big place for filming movies. The CN tower would me one of my picks for sure, I love seeing cities from above, and that restaurants sounds cool too! I love the restaurant at the top of the CN Tower- the view is unbeatable. And for a photography nut like me, you can’t beat the Distillery District!